March 6th I had the opportunity to attend Candice Nicole & The Womanly Curve Magazine event "Defining Your Womanly Curve" in Washington D.C. 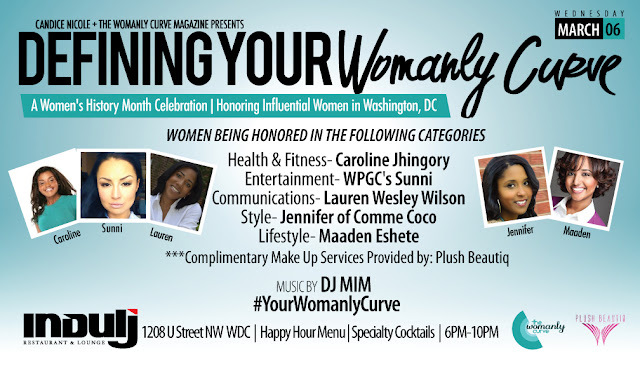 The event was held to honor five influential women located in the D.C metropolitan area honorees included: Health & Fitness Caroline Jhingory Entertainment WPGC's Sunni Communications- Lauren Wesley Wilson Style- Jennifer of Comme Coco Lifestyle- Maadan Eshete. All of these women have collectively defined their womanly curve through their fields. As women, it is important to celebrate the accomplishments of one another and to support each others dreams. Music was be provided by DJ MIM, with complimentary makeup services by Plush Beautiq. I had a great time networking and meeting many influential women in the D.C area . Check out the photos below and tell us how you define your womanly curve.